Life is a bit crazy right now, as evidenced by my ONE post in February. (One!) My reading has slowed down considerably, but I did manage to finish two books after The Girls, and I want to post about them before too much time goes by. 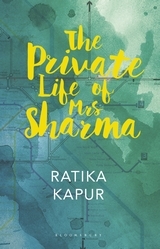 The first was The Private Life Of Mrs. Sharma, by Ratika Kapur. It’s about Renu, an Indian woman in her late 30s who lives with her son and in-laws in an apartment in Delhi. Her husband is working remotely in Dubai in order to make more money, while Renu works in a doctor’s office in Delhi to help support the family. She’s a modern woman by Indian standards – she works outside the home and has a fair amount of freedom – yet she is traditional in that she dotes on her son, lives with her husband’s parents, does most of the housekeeping, cleaning and nurturing, and has rather old-fashioned views about how marriage works. One day, Renu meets a young man named Vineet on the train, and instead of telling him that she is married, she strikes up a friendship with him. They spend time together on a regular basis when her son is in school. It starts as a platonic friendship, an escape for Renu to fill her lonely hours. The book is written as Renu’s private inner dialogue, and she comes across as chaste and naive as she spends time with Vineet – but justifies it as something she deserves because her husband is away and her son needs her less. Of course, Renu is not as innocent as she portrays herself, and before long things have progressed into a dangerous zone, with their relationship turning physical and her ability to keep her two lives separate in jeopardy. The Private Life Of Mrs. Sharma is about the collision of old and modern, as well as freedom and responsibility. Kapur’s language is strikingly simple – almost childlike – yet also formal and sort of indignant. (More contradictions!) I can’t settle on how I felt about it, or about Renu – despite her selflessness and devotion to her family, she was also immature and selfish, caring little about the desires of others. And there’s a surprise ending which seemed really out of place. So this was a mixed bag for me. I liked that it was set in India, and it was an easy, engrossing read that effectively explored some of the tensions in modern middle class Indian society. But the protagonist was frustrating, the language almost claustrophobia-inducing at times, and the ending was jarring. More posts coming, I promise.